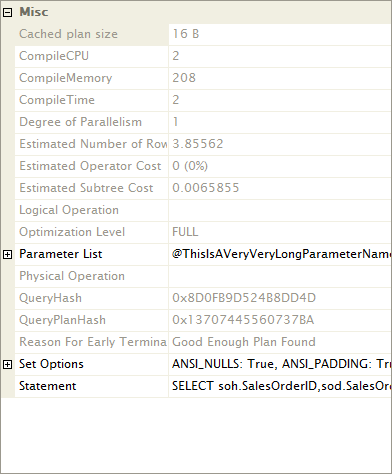 I saw an odd statement the other day, “The size of the name of the parameter does not affect performance.” My first thought was, “Well, duh!” But then, I had one of those, “Ah, but are you sure” thoughts. And you know what, I wasn’t sure. If you compare the two, you’ll see that they’re the same. In fact, if you look at almost all the values, you’ll see that the Compile CPU, Compile Memory, and Compile Time are all identical. Based on all this information, I have to conclude that no, the size of the name of the parameter doesn’t affect performance, positively or negatively. But why? I’m actually not 100% sure, but based on some things I know, here’s what I think. 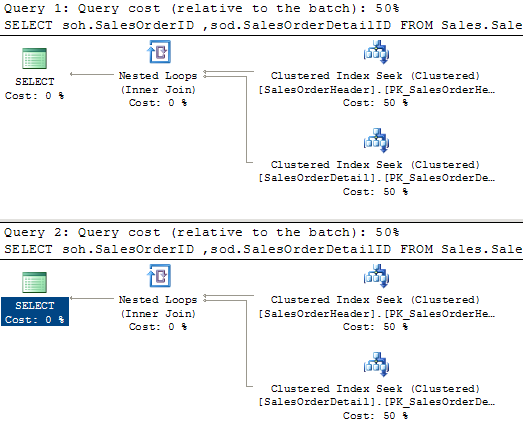 The Algebrizer within the Query Optimizer breaks down all the objects referred to within a query plan. It assigns them all values and identifiers for that plan, part of getting the information together to feed the plan into the mathematical part of the Optimizer. 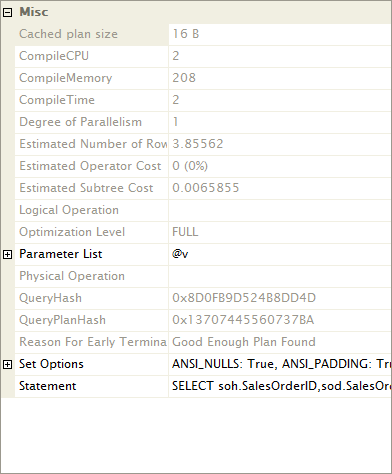 I’ll bet it just assigns values to parameters that are the same type of value, if not the same exact value, and that value is the same size from one execution plan to the next. This means that you don’t save memory by assigning parameters @a, @b, @c when in fact you mean @ReferenceCount, @MaxRetries, @BeginDate. Do I think you should put in parameters of the silly length I put in before? No, of course, not, because it makes the TSQL code less clear. But, so does putting in equally silly, short, parameter names. Don’t make your TSQL code hard to read. It doesn’t help performance.